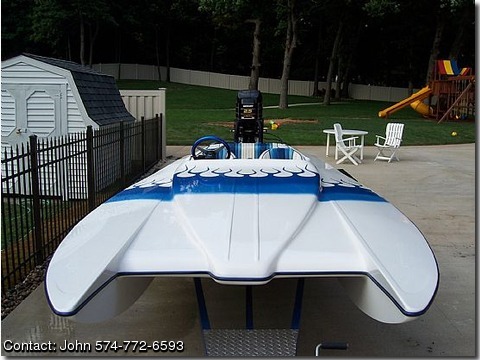 Boat has full custom canvas,hot foot accelerator, spark advanced box, 2 axle trailer. As of 8-18-05 a 2001 merc 225 promax efi was put on the boat. The new motor is stock with a 4 hole cle lower. I put it in the lake 8-19-05 and she flew in the 90s .It may do 100mph .motor came off a fishing boat that was rarely used.This boat is super clean and in fantastic condition. A great boat in the chop !!! Also has prostar hydrl. steering and mathing bezzles & full instrumentation gauges. Room for 4-5 people to ride in.